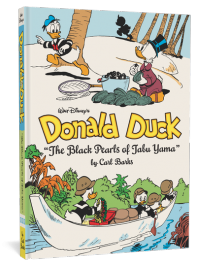 In our title story, it’s Christmastime, and Donald, Uncle Scrooge, and the nephews are searching for rare black pearls on a remote island. But when their boat is sucked into an underwater cavern, they find themselves facing the fury of the island’s volcano! Then, to do battle against an invasive bug species, Donald and the boys head off to the uncharted jungles of the Amazon rainforest to bring back the bug’s natural enemy species. But a mystery foe, out to foil their mission, sends a crocodile stampede their way — which is only a warm-up to the stampede of dinosaurs they face when they get to The Forbidden Valley. No, it’s not nice to fool with Mother Nature! Also, when Gyro Gearloose invents a rocket to enter an “Around-the-World-in-80-Minutes” race, Donald agrees to pilot the ship — but he doesn’t know that his opponent is none other than Gladstone Gander — whose infernal luck never lets him lose! 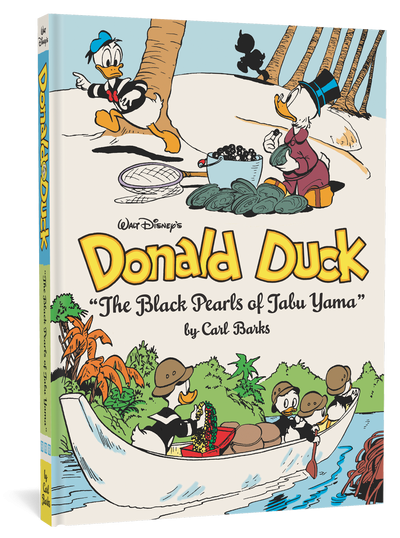 Carl Barks delivers another 170 pages of imaginative exuberance, rollicking high adventure, and all-around cartooning brilliance, in addition to insightful story notes by an international panel of Barks experts. Uncle Scrooge and Donald Duck - The Three Caballeros Ride Again!